This lovely combo comprises of four utensils. Each an essential to create culinary masterpieces or simple delicious food! You will definitely see quality in these modern marvels from Nirlon. The high grade aluminium and stainless steel body can withstand high temperatures without losing their shape or sleek finish. Its non-stick inner surface regulates oil usage and cleaning efforts. Each vessel in this combo collection is both induction and gas stove compatible. They come in a stylish design and classic black colour. The 4 piece cookware set is a fun gift for friends or family who love to cook. 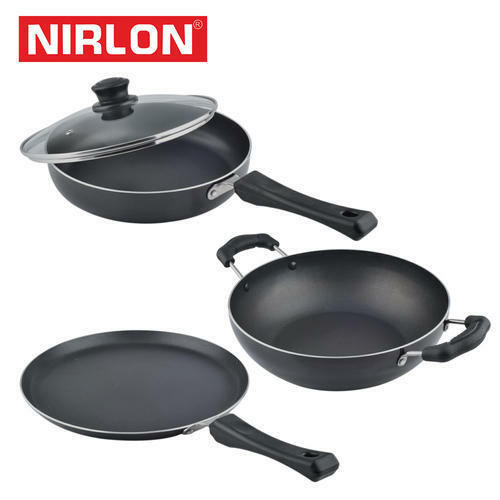 Caution: To maintain the quality and cleanliness of your Nirlon cookware, wash it by hand. Packaging Details Printed color boxes with master box.